Winning an Emmy for “Exceptional Merit in Documentary Filmmaking”. we congratulate HBO Documentary Films and the talented team who have helped raise awareness of Progeria and PRF’s work through this exceptional film. LATS continues to impact viewers with its message of love, determination and hope for children with Progeria. Check out the impressive awards list and how you can own a copy here. 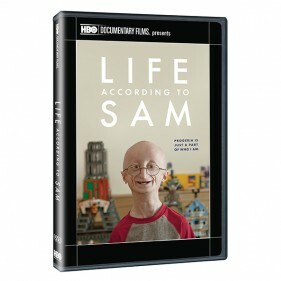 How thrilling that Life According To Sam won a 2014 Creative Arts Emmy for “Exceptional Merit in Documentary Filmmaking”. Our heartfelt thanks to Sheila Nevins and Nancy Abraham of HBO Documentary Films, Sean Fine & Andrea Nix Fine, Jeff Consiglio, Pablo Durana, and the entire talented, passionate team who have helped raise awareness of Progeria and PRF’s work through this exceptional film. Sam continues to impact viewers every day with his lasting legacy of hope, determination and love. It all started with the Sundance Film Festival. Since its premiere in January 2013 at this prestigious festival, Life According to Sam had an amazing run on the festival circuit, captivating audiences across North America. LATS and its Oscar winning Directors Sean Fine and Andrea Nix Fine even made the “short list” for Oscar consideration, a tremendous honor. LATS was chosen as one of the “Best of Fest” at the AFI Docs Festival in Washington, DC, was the Audience Award Winner at the Nantucket, Boston Jewish, Newburyport and Martha’s Vineyard Film Festivals, received the Best Storytelling Award at Nantucket , won Best Feature Documentary at the New Hampshire, Woods Hole and Rhode Island International Film Festivals. In April 2014, the film also won a Christopher Award, which is presented to filmmakers whose work affirms the highest values of the human spirit. Also in April, LATS was honored at the prestigious Peabody Awards, which recognize “stories that matter”. Awarded to 30-40 winners annually from more than 1,000 entries, its story of love, life and hope for children with Progeria continues to “matter” to more people every day.